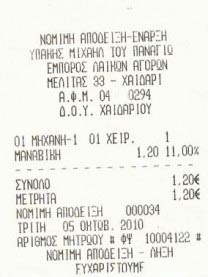 For the first time in history, farmer’s market vendors in Greece are obliged to provide receipts for all sales from October 1, 2010. But how many are actually doing it? At my neighborhood laiki agora, not many. Many have registers but claim the machine is broken or will not automatically give a receipt. Despite asking for receipts as the “crazy xeni who doesn’t know how things work here,” and irritating vendors to the point of bruising my produce and being on the receiving end of some gesticulating, this is the only receipt I’ve been given. Protos kai monos, much like my view toward marriage. I didn’t even have to ask for this one; he handed it to me with my change and a smile. Because I believe in rewarding moral behavior and doing the right thing, I’m happy to give him my repeat business. And in case you’re curious, I bought two white peaches. They were guiltlessly delicious. *Note: Receipt was intentionally Photoshopped to protect the vendor’s privacy and mine. congrats on getting a receipt. I would be too timid to hear the tirade of disdain to even attempt such a thing. I’m glad to know that somebody’s asking for receipts! I don’t ask, but I’m getting them at about half of the vendors at the market in my neighborhood. I got a receipt from everyone, without asking! they just popped it in the bag! @jess I always ask no matter where I am – periptero, pharmacy, gas station. I don’t see why I should pay more tax at the end of the year because someone else is breaking the law. @constantinos You always remember your first. Miracles can happen. @maria That’s excellent. Some people in other areas of Greece, such as Thessaloniki, say they haven’t gotten a single one. So I take it that you are back in Greece then? I thought you left for other adventures. I’m glad to hear that you are back there so I can hear about all the new happenings. I’ve been notified that there is off-site speculation about my whereabouts, and people are free to make assumptions — right or wrong — based on this receipt. But my private life will remain fiercely shielded, and readers are encouraged to have their own adventures. This website has always focused on practical information pertaining to Greek bureaucracy and news not otherwise covered in English, not my life. Consider following the Twitter feed to learn what’s happening. Hi Kat! Long time no talk! Well, at least you got your receipts. 😉 And thank you for the info.